What do Lion Brand Fisherman's Wool and Kool-Aid have in common? Last week was a week of indecision. I’ve started and torn out stitches over and over again. I want a cowl. I know I want a cowl. I just haven’t been able to get that going. Then, indecision hit the socks. I didn’t finish the socks, and I really should’ve been able to. Then I tore out the blanket. No more blanket. Nothing got finished last week. Then I stumbled on this Knitty article about dyeing wool with Kool-aid. I had heard on Kelly Petkun’s Knit Picks podcast that this could be done but hadn’t given it much thought. However, something about the article just really got my attention. Candy colors, to borrow Ms. Petkun’s phrase. Maybe that was what my knitting was missing! I am now a few rows into a new cowl. It’s plain stockinette stitch with an inch ribbing. The color is not what is shown in the picture above. That’s for a different project, but the cowl’s wool is the same brand, Lion Brand Fisherman’s Wool. I had a basic cream of that wool in my stash for the longest time. It’s the only real wool in my collection (sigh, I’ll be a real knitter someday), so it was the only wool I could try this experiment with. 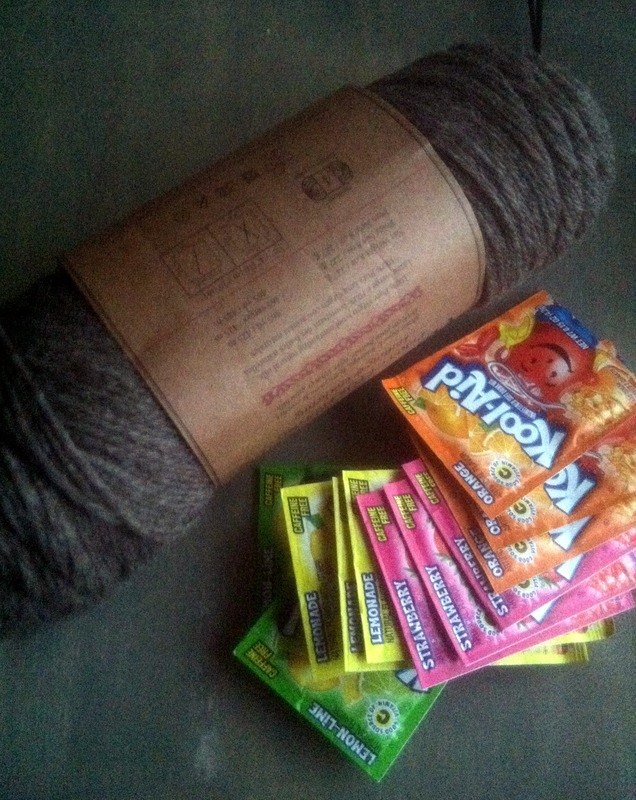 I’m going to knit up the cream wool and then mix up some dye (not with all of that kool-aid; I’m going to test things out on small bits first). I’m hoping to get an eye-catching color that will make the plain knit really pop. The brown wool you see in the picture is for my husband. Back during Christmas, I promised him I’d knit him a sweater in 2012. Originally, we picked a Knit Picks cotton yarn to do the sweater in. We stopped by Michaels Saturday night, though, and he fell in love with the wool, which is a wool I fell in love with ages ago. Using calculations for the cotton, we guestimated how many skeins to get. Luckily, all Lion Brand yarn was 50% off, so the price dropped considerably. I ordered the needles for the sweater from Knit Picks yesterday. I opted for the interchangeable, but not the full set just yet. I stuck with size 6 and 5 with an extra-long cable. It should arrive in a few days, and then I’ll get started right away. I’m so excited to get to work on this sweater! I’ve never made on before, so I’m really nervous. If anyone has any tips, please send them my way!